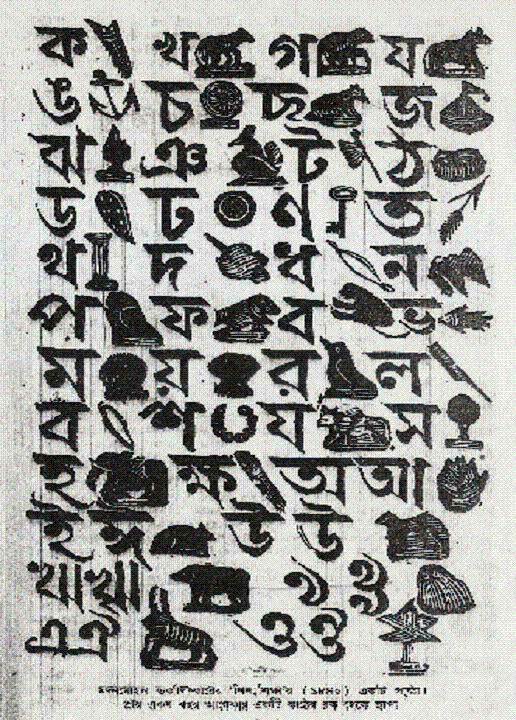 An early Bengali wooden typeface printed in one of Madan Mohan Tarkalankar’s books from 1849. He was a poet, scholar of Sanskrit, and children’s book author. Mohan taught at Fort William College (one of the earliest British settlements), helped found the “Native Female School” for girls in 1849, and established a printing press in Kolkata. This early design seems to have been a major influence for the most common text typefaces today, such as Linotype Bengali. Image from the Cyber Archive of Bangla Graphemes.